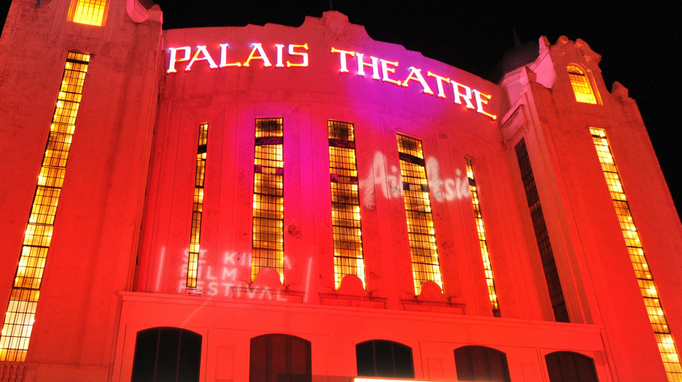 The St. Kilda Film Festival is always a wonderful opportunity to showcase some excellent Australian filmmaking talent, and Session 5 of the Top 100 shorts – Mysteries! Thrillers! Horror! – had plenty of talent on display. It was intriguing to note that there was a theme of horror and humour running through the majority of the shorts on display, even for those not clearly demarcated as ‘comedy horror’. Humour in horror and thrillers often work to break the tension, but as someone more used to watching a feature length horrors than horror shorts, I was intrigued to see how horror and thriller shorts are constructed. Three teenage boys, Sam, Bobby, and Richie, set out for Jerry’s house on Halloween night. Kids are trick or treating everywhere and at first it seems like the boys are out to play a harmless trick of their own. The twist when revealed is surprising and things take a sinister turn. The lead up to the twist was, sadly, underwhelming. What happens when a vampire who uses a dating site to seek out her prey meets someone she doesn’t quite expect? This noir-ish horror was fun to watch, if over a little too quickly. I would have liked to have seen it a bit more paced out. Florence (Charly Thorn) rescues a cat from a group of teenagers, but only when she takes it home do her true intentions become clear. It’s shocking, horrifying, and looks fantastic. Two friends prep for the end of the world. Visually it works, and the constant news reports in the background of natural disasters and freakish weather lend the film its intriguing edge. The psychological aspects at play – the two start to lose it in their isolation – are the strongpoints of the film, but the ending was a little unsatisfying. Simon is on a date with Maggie when she reveals that she is a pathological liar. As the night progresses, Simon gets more and more paranoid, questioning everything Maggie does, as the night gets darker and more dangerous. This was my least favourite of the night, even though the premise was strong and the actors talented. Once again, the ending wrapped everything up too neatly. It’s 28 Days Later but with an Australian twist! Contaminated water means that the Australian wildlife have turned into bloodthirsty creatures, endangering the human population of a small country town. Very fun. This may have been the crowd favourite of the night for sheer cleverness. A dad reads his daughter a bedtime story, but gets the shock of his life – short and startling! Set in the far future, a robot is sent to investigate a problem on the cargo vessel T57. This stop-motion animation was an intricately detailed production, and in that sense is an achievement on its own. T57 is one of the more unique films I have seen at the St. Kilda Film Fest. There’s a very sinister vibe to this right from the start. A man is jealous of his wife and his best friend – is this paranoia at play? Tense, well acted, with impressive cinematography, but perhaps a little too ambiguous. The Witching Hour begins at midnight – the session ended on a high with this entertaining piece set to the Danse Macabre. It put me in mind of a classic horror tale, or something out of a Neil Gaiman story, as all manner of creatures come out at midnight. There’s plenty to enjoy.